Located in the Van Vorst Park Historic District of Jersey City, this project featured a meticulous restoration of the historic street façade of this 1870s Greek Revival Rowhouse and a modern transformation of the interiors beyond. Extensive structural, thermal, acoustic and fire-protection upgrades were incorporated to improve the efficiency and performance of this historic home. Spacious and light-filled, the design of the primary living area is elegant yet unpretentious. A palette of subtle warm whites and light grays complements the rich natural beauty of new wide plank walnut floors. 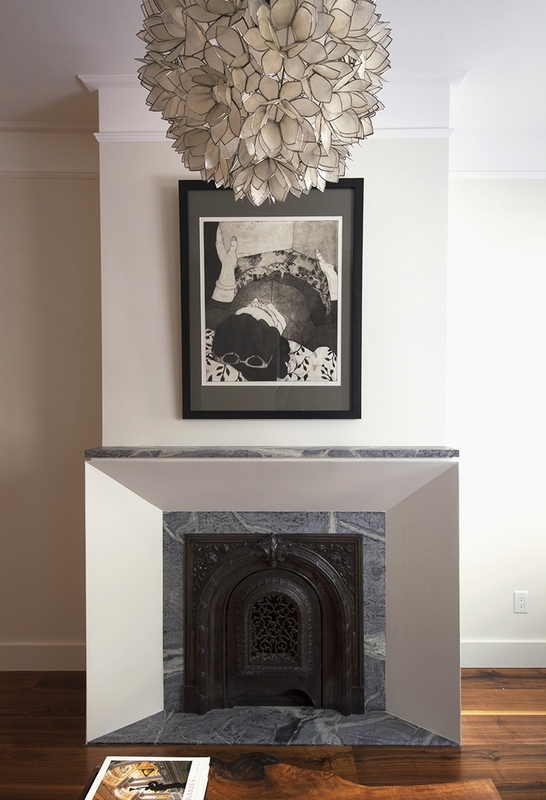 Crisp plasterwork details and a soapstone mantle provide a quiet frame to the original cast iron summer screen on the main fireplace. Pocket doors separate the master bedroom from an adjacent sitting room where the original hearth was uncovered and painstakingly restored. 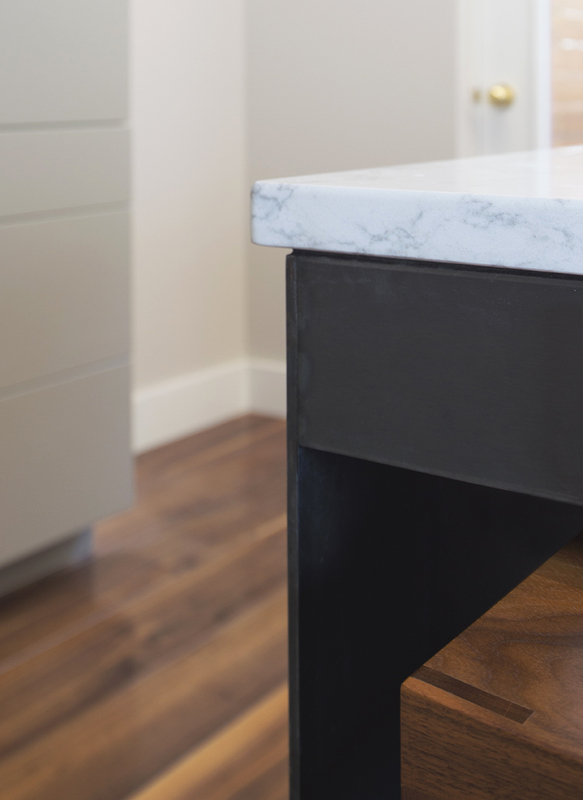 Clad in hot-rolled steel, the kitchen island is a resonant focal point. It is set against the clean lines of kitchen cabinetry that operate on touch latches and are therefore unencumbered by hardware. With the goal for the master bath to be warm and inviting, we designed it with natural stone surfaces, warm woods, and brushed gold hardware. As in any row house, with space at a premium, we worked in close collaboration with the contractor on a custom-built shower compartment that folds flat against the wall when not in use - allowing a full bath's function to take the floor space of a powder room. A new skylight, pendant and plastered-in LED lights brighten a once confined stairwell. We restored the street facade to its original 1870s condition - decades of paint removed, brickwork carefully repointed, through-wall A/C penetrations meticulously erased, brownstone elements reconstructed and repaired, a new iron gate built to match the existing fence, restored entry woodwork, new efficient windows, and replica gas lamps. When structural improvements necessitated the reconstruction of the rear facade, we took the opportunity to improve the performance of the building envelope. A continuous layer of mineral wool insulation outboard of the sheathing significantly improves the thermal performance and also enhances the fire resistance. Battens were applied over the insulation onto which the siding was attached. The air space helps to ensure wind-driven rain does not enter the wall assembly.